Last weekend we set off on a trip to spend 48 hours in Italy for a slightly belated Birthday trip. 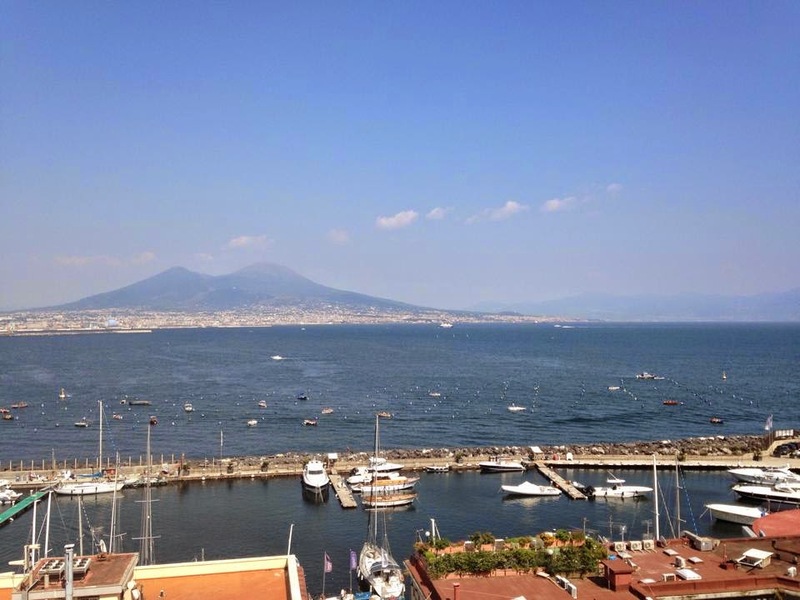 Naples often loses out to neighbouring Sorrento and the other towns along the Amalfi Coast but for a city break. 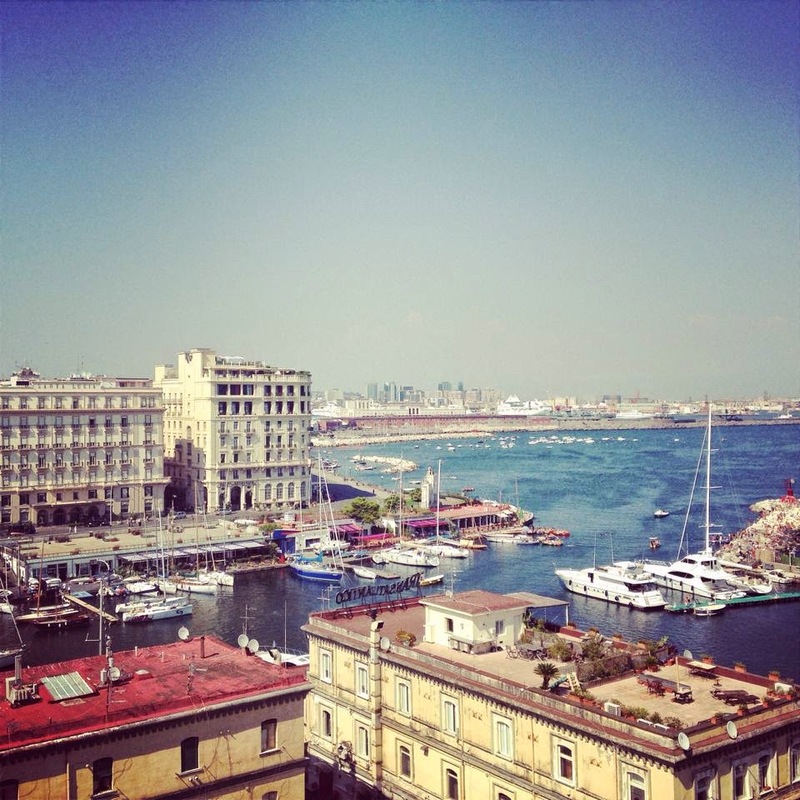 But I just really wanted to go there, I think Naples is great. I would much rather spend a couple of weeks travelling along the Amalfi Coast and not rushing rather than having a weekend break there. We travelled via Rome as the flights were much cheaper. 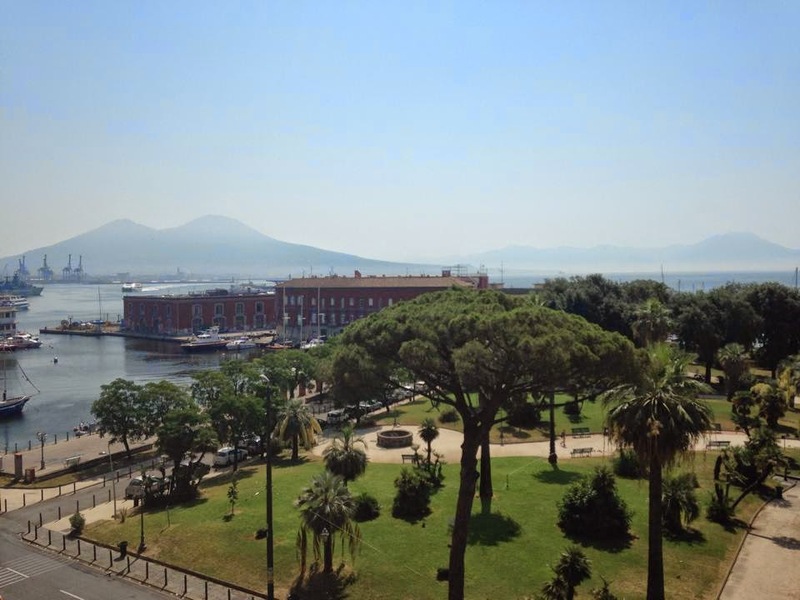 There is a high speed train from Rome Termini to Naples Centrale at about 1 hour or a more scenic route train that is 2 hours. The 2 hour train was much cheaper and went by the sea and the vineyards so there was some lovely scenery to look at. I didn’t end up opening my reading book as I enjoyed the view so much. The trip began with a stay overnight in Casa Di Amy bed and breakfast near to Rome Termini station. While I would thoroughly recommend this place to anyone staying in Rome I would only stay there if you are arriving early in the day, the 15 Euro charge for arrival after 10pm is completely ridiculous and was 1/3 again of the price I paid for the room for one night! 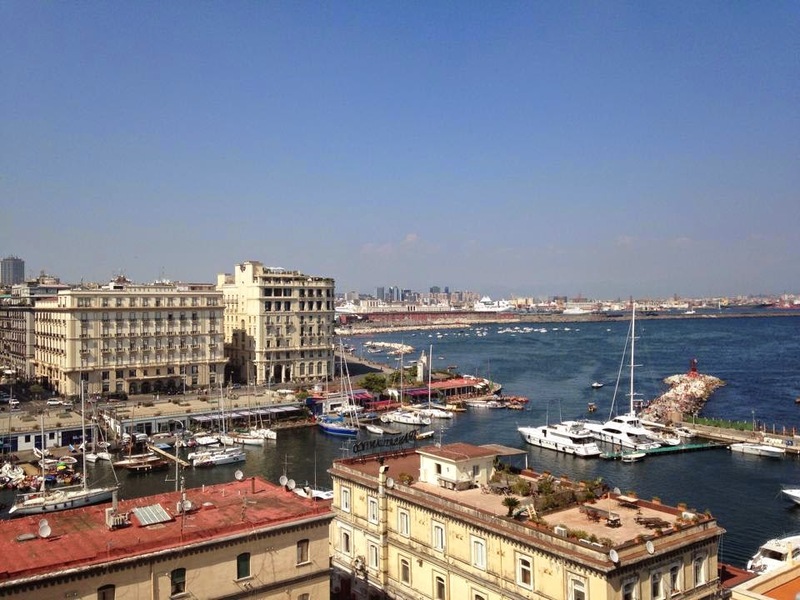 I had looked at blogs and guides online and they do make you slightly frightened that everyone in Naples is out to rob you or run you down on a moped. If you live or work in a big city such as London just use a similar sort of caution as you would normally and everything should be fine. My tips would be: always be vigilant about your passport, wallet, phone etc. and do not flash them about, don’t wear a flashy watch or jewellery so you don’t look like a target. The first thing I noticed on arrival was the heat! 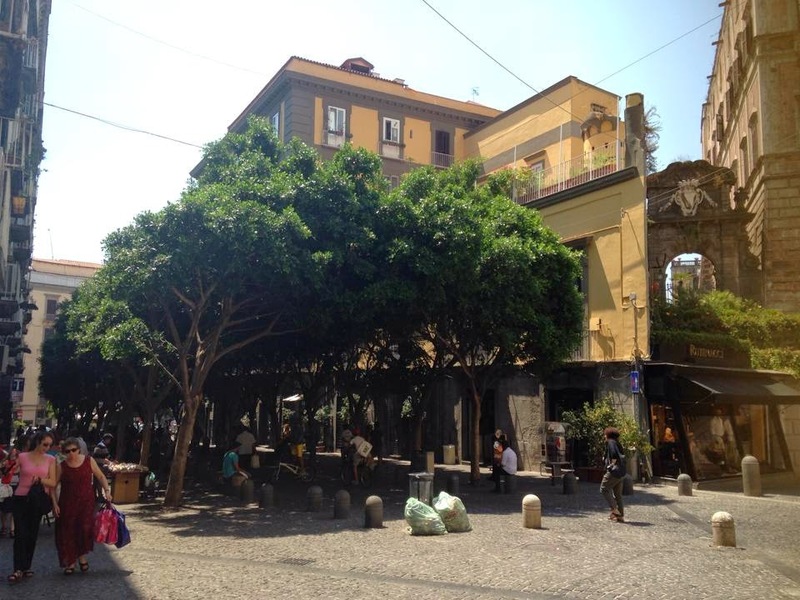 Naples definitely felt hotter than Rome and it seemed more humid than in Rome. I wore sunglasses for most of the time and SPF 30, I would recommend both of these things to prevent sun damage, SPF 30 was fine and I didn’t burn at all despite walking around in the sun for most of the weekend. I enjoyed the contrast of the architecture, tiny streets, amazing food, the little stalls and shops and the beautiful blue sea of the bay. We had a little paddle in the sea which was much needed after walking around and the water was so clear. 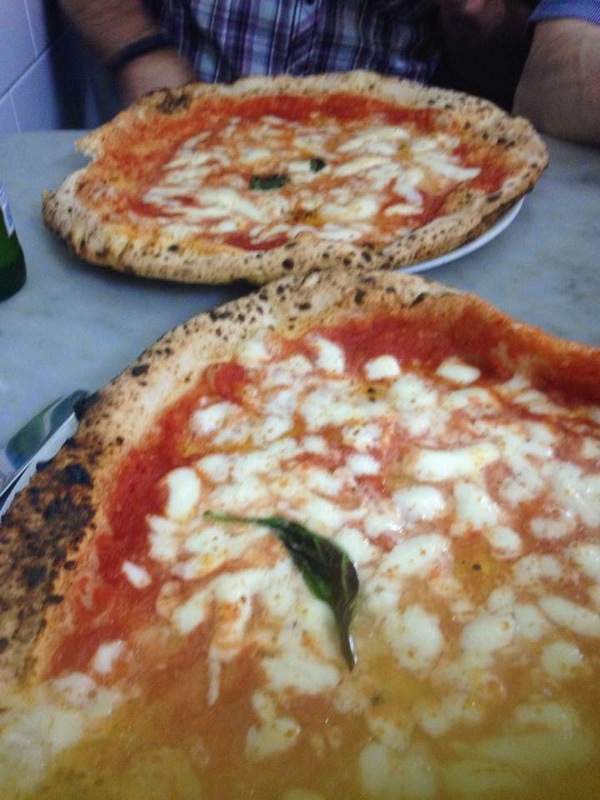 Naples has a reputation for some of the best food in Italy and I completely agree, even in 2 days I had some food that I won’t forget. 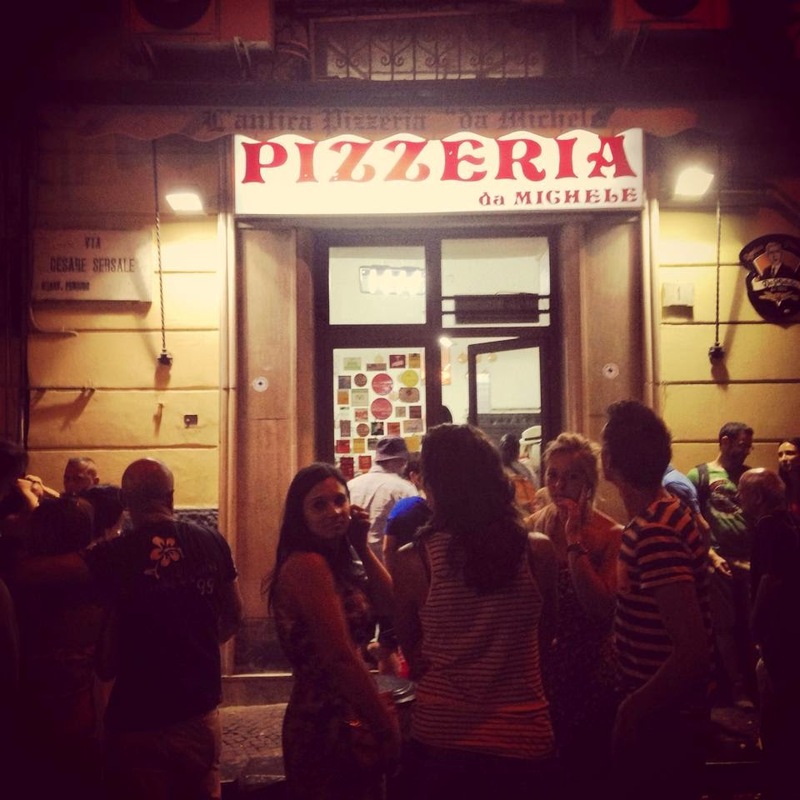 The Margherita pizza at Pizzeria Da Michele is so good that there was an hour long queue and we had to take a number and wait outside for it to be called, I can assure you it is worth it, it was the best pizza I have eaten in my life, and was 4 Euros…. I couldn’t believe it! The simple flour and water pizza dough had a crust that was puffed up and crisp but not overcooked, the topping of buffalo mozzarella and tomatoes were so flavourful and delicious I really could go on and on about this pizza for a long time. The pizzas are cooked very quickly in a wood oven which is open to the restaurant and the sauce on the pizza is quite liquid compared to a pizza that you would get in the UK, for example, however (as I noticed some people complaining on tripadvisor..what’s new) this is how the pizza is supposed to be! Amazing, just amazing. There are some pictures above and below of the pizza and of the outside of the restaurant, in case you ever get to go there. After the pizza I suggested we stop for a gelato, I thought it was a must to try in Italy. We went to Polo Nord Gelateria which was around the corner from both our hotel (Hotel Garibaldi) and near the pizzeria. The ice cream was the best, I had pistachio and raffaelo, I couldn’t believe they even had kinder egg ice cream, I was in heaven! Ice cream in general isn’t my favourite but this was just on another level of awesome. Pastries are a big thing in Naples and coffee is obviously massively popular in the whole of Italy so we had a coffee and then a croissant to go for our breakfast whilst sightseeing, Italians seem to really love Nutella, as do I and I was so happy to find out that instead of the chocolate croissant I thought I had asked for, it was instead filled with warm Nutella, the only word for it was SHAMAZE! So warm and buttery and delicious, the cappuccino was also amazing, I don’t drink that much coffee because I often find it too strong but this was perfect. We also visited a chain, which isn’t normally what we would do but as we’d never been to a chain in Italy it seemed ok! 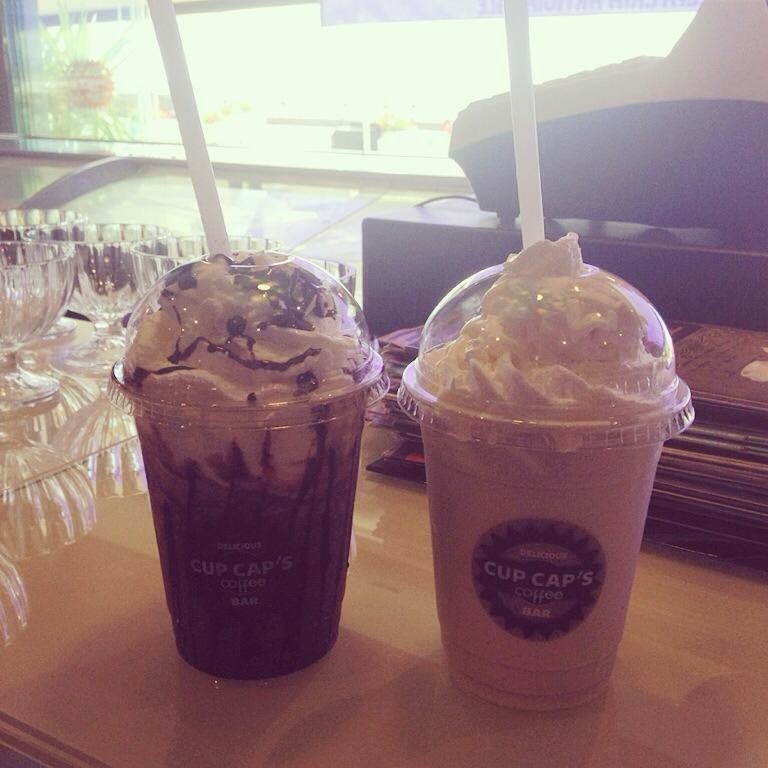 It was called Cup Cap’s Coffee and they serve coffee, frappe’s, ice cream, smoothie’s and some cakes and snacks. I had a white chocolate ice-a-uccino and it was to die for, I love white chocolate, also very reasonably priced and refreshing in the heat. You can buy water everywhere for around 1 Euro and I recommend stopping regularly for a bottle to stop dehydration. 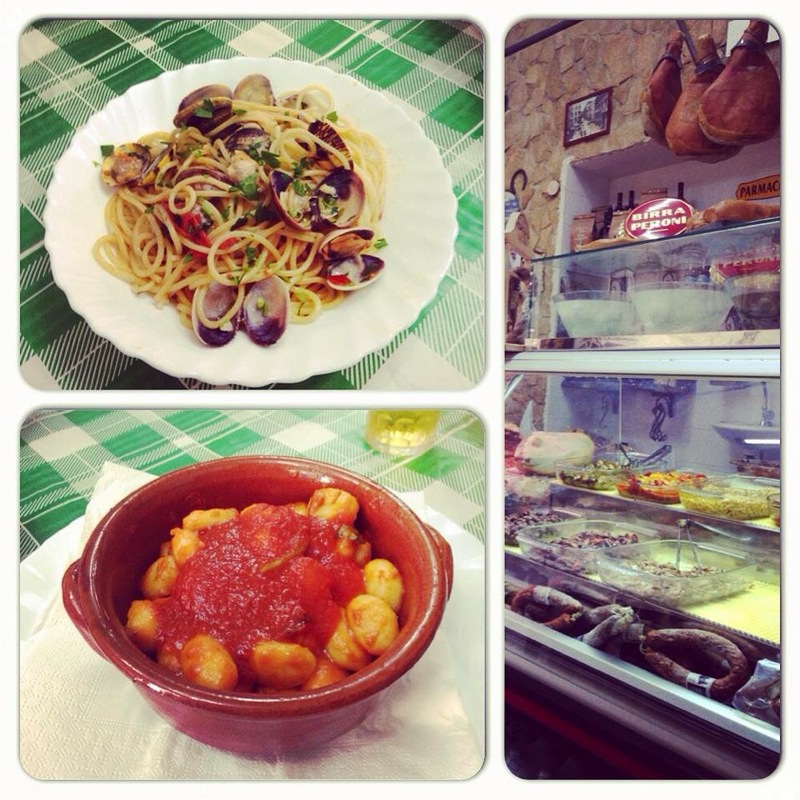 We had lunch in a tiny restaurant called Antichi Sapore on the Sunday and I opted for Spaghetti alle Vongole. I occasionally make it myself at home as it’s not that difficult but mine always seems to fall a bit short in my opinion and I prefer to eat it at a restaurant. The meal was delicious, I am not sure if they have secret ingredients they put in or if it was simply the fresh Napoli produce that just made it taste so good but it was probably the best I have ever tasted, bf had the Gnocchi and was also impressed, it was fresh, simple and delicious. Hotel wise we stayed at Hotel Garibaldi as it came well recommended on google and I thought it was a great location as it was near the station and near the main streets. 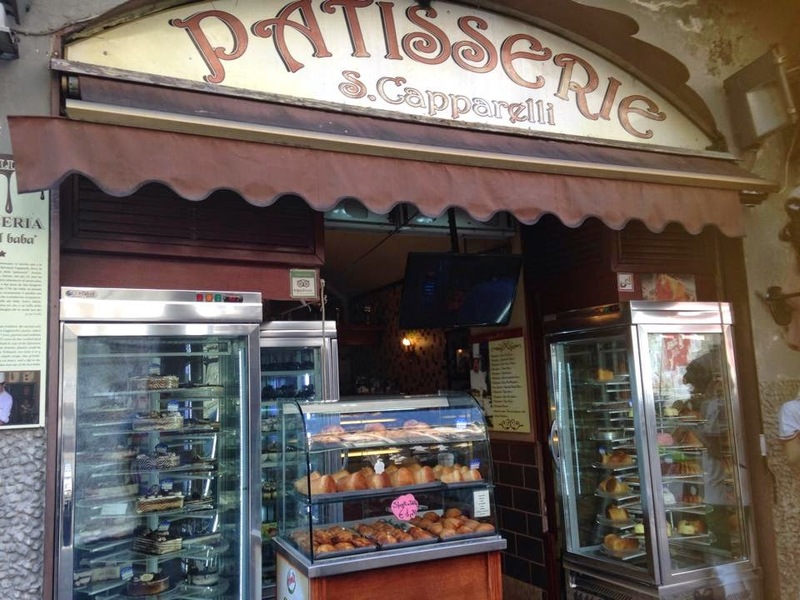 It was well priced and the staff really nice and helpful. On arrival they let us store our bags in reception so we could set off on a wander around the town, provided us with a map which they marked out with places to go for different things (best place to get a drink, best place to walk around etc.) and our room had great air conditioning and was very clean, most importantly the bed was so comfy which we needed after our long walks. The wifi is free and they even let us store our bags after checkout and nip to the loo before our train journey back to Rome. We spent a lot of time on both days just walking around and exploring, we went around the tourist areas, down to the bay, looked around one of the castles, had a paddle in the sea and went up and down lots of tiny streets just checking everything out. I even managed to walk for 5 hours on Saturday, I was quite impressed with my stamina, I am glad I did as we saw so much in such a short amount of time it was fantastic. We only went on one arranged tour and that was at the opera house. I unfortunately didn’t ask the name of the lady who did the tour but she was great, she was passionate about what she was talking about and very engaging, the trip was only 40 minutes long but I learnt a lot and she did a great job. It makes so much difference when the guide is good to how much you learn as you tend to switch off if they aren’t a good public speaker. 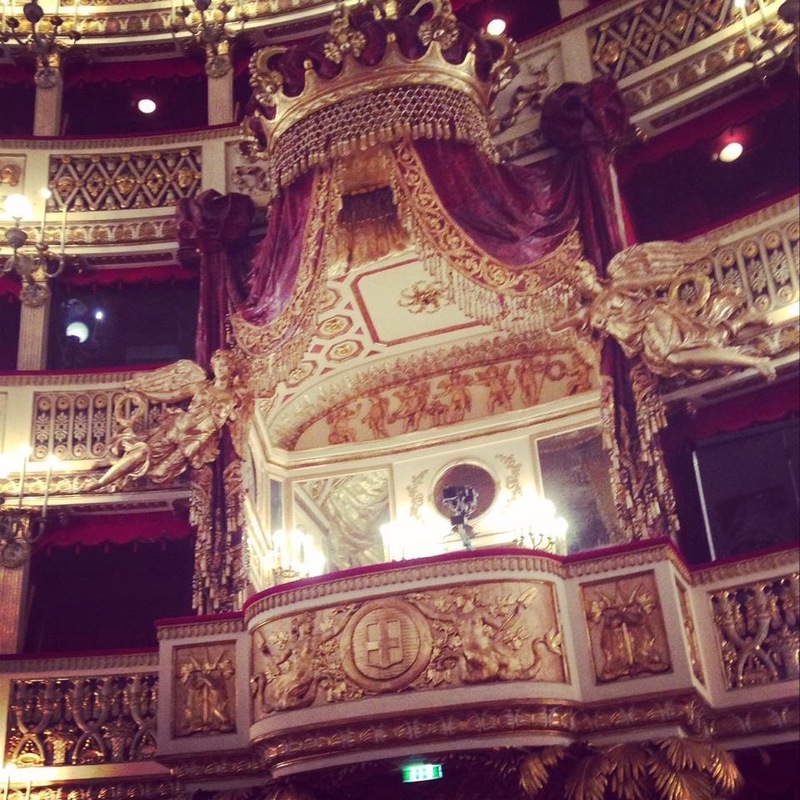 I fully recommend this tour, not that I am an opera fan per se, I have never seen one, but the opera house is beautiful and you really learn more about the city and opera in general. 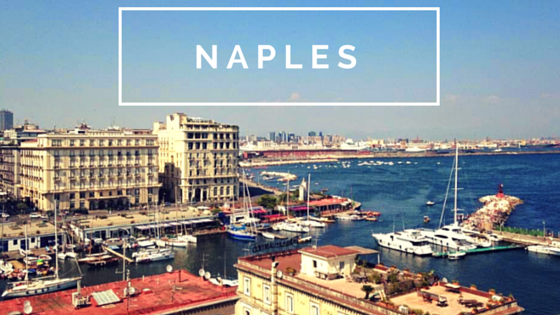 If you love food and exploring then Naples should be added to your must-travel-to list. We had a fantastic weekend, I had some of the best food of my life and came back with tired legs and some amazing memories.